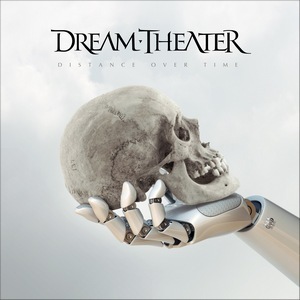 Progressive music’s most polarizing band, Dream Theater, are back with Distance Over Time, the band’s 14th studio album, and first since 2016’s bloated concept double-album, The Astonishing. In a way, Distance Over Time sees the band returning to their roots. For the first time in decades, Dream Theater wrote, rehearsed, and recorded together as a single unit (in contrast, The Astonishing’s music was written by John Petrucci and Jordan Rudess), and the energy and spontaneity of that experience shines through at times here. Opening songs “Untethered Angel” and “Paralyzed” get Distance Over Time off to a great start, both songs mixing aggression, virtuosity, and adept songwriting much like the band’s earlier vaunted releases. “Paralyzed” in particular projects the same feel and mood as material from Train of Thought. “Fall Into the Light” would be right at home on Octavarium – it’s a very dynamic song, well-arranged and slickly played without being overdone. The two longest songs, “At Wit’s End” and “Pale Blue Dot,” are well done, semi-epic prog tracks. The former’s subject matter deals with the aftermath of abuse, while the latter takes its title from a Carl Sagan novel. Both songs are more firmly established in the band’s previous progressive metal style, heavier than recent output. As always, Petrucci and Rudess provide plenty of intricate (and of course, at times self-indulgent, but that’s the nature of progressive music) solos. Of note is the fact that the songwriting is also more succinct here than in the band’s recent past, with no song length exceeding ten minutes. Two of the hardest-hitting songs, “Paralyzed” and “Room 137,” clock in at just over four minutes. The production is very loud and aggressive here as well, especially compared to The Astonishing. Mangini’s drum sounds are massive and thunderous – in fact, they’re almost out of place – while Petrucci’s guitars cut through the mix with aplomb. Rudess at times uses cheesy synth sounds, as is his wont, but also some excellent organ and piano patches. As with other recent albums, we could use a lot more of John Myung’s bass. Aside from his complex riff to open “S2N,” he is once again nearly invisible. Overall, Distance Over Time is a definite improvement versus The Astonishing, and just might be their best effort since Octavarium, with plenty of progressive metal sophistication and some catchy songs. Aside from a few weaker cuts and some questionable sound/production choices, Dream Theater have returned to the form of their earlier days in fine fashion.